International Journal of Research in Health Sciences,2013,1,2,62-68. Department of Orthopaedic Surgery, King George's Medical University, Lucknow-226003. 1- Associate Professor, 2-Professor, Lucknow-226003, Uttar Pradesh, INDIA. Background: Today about one fourth of biomedical waste is considered as hazardous and may affect the health of both medical personnel and general community. As medical students are going to be one of the important components of health care system, they should have proper and sufficient knowledge on biomedical waste management. So awareness about various aspects of biomedical waste management has to be assessed frequently. Objective: To know the existing awareness and knowledge about biomedical waste management among medical students of a tertiary care hospital, Tirupati. 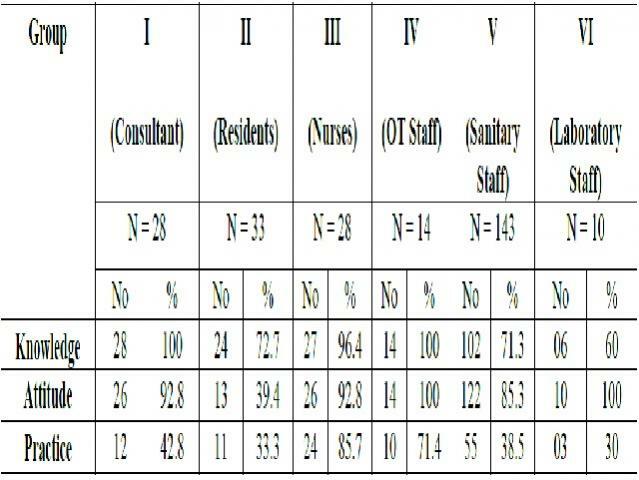 Material and Methods: Cross-sectional study was done in 127 students of 7th semester from Sri Venkateswara Medical college, Tirupati, by pre-designed questionnaire. The responses were analyzed using epi info software 3.5.1 version. Results: Majority (74.8%) of the students are between 21-22 years. 114(89.8%) students are not aware of BMW legislation. It was found that knowledge regarding handling and safe disposal biomedical waste management among 54(42.5%) medical students was inadequate. Majority has deficient in knowledge and awareness regarding categories of bio medical waste (73.2%) and its disposal in colour bags (71.3%). Conclusions: Frequent awareness campaigns and classes may be conducted to improve the knowledge about safe handling and disposal of bio medical waste among medical students for future practical application.